The latest NASA astronaut class to be chosen had the highest percentage of female astronauts selected at 50%. This taking place in 2013, the year celebrating the 50th anniversary of the First Woman In Space, Valentina Tereshkova (& the 30th Anniversary of the First American Woman in Space, Sally Ride). Four out of the new eight astronauts are female with a breadth of experience among them, with women now representing 26% of NASA’s astronaut corps. It’s really wonderful to see these women being recently featured in mainstream media, especially Glamour Magazine, a media outlet that’s followed by millions of women around the globe (1.17M followers on Twitter!). 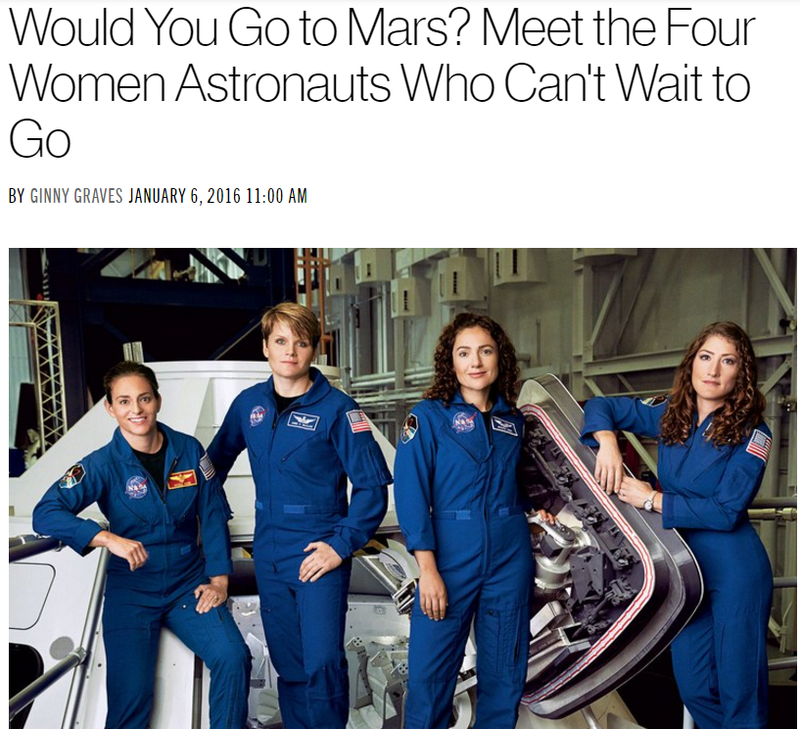 Glamour does a fantastic job of interviewing the most recently selected female NASA Astronauts, experts in a variety of scientific fields. Namely, Christina Hammock Koch, former NOAA station chief in American Samoa, Nicole Aunapu Mann, US Marine and F18 fighter pilot, Dr.Jessica Meir PhD, former Assistant Professor of Anesthesia at Harvard Medical School and Anne C. McClain, US Army and OH-58 Helicopter Pilot. (Dr.Jessica Meir PhD is also a graduate of my alma mater, International Space University (ISU) (MSS00), making me proud to be an ISU alumna myself!) The article also featured quotes from the inspirational Dr.Dava Newman, Deputy Administrator of NASA. Governments around the world—in China, Europe, and Russia—have plans in the works to at least land robots on Mars, while in the U.S., private companies like SpaceX are partnering with NASA on a human mission and plotting their own commercial trips. And unlike the 1960s race to the moon, this time women are playing pivotal roles—building rockets, designing space suits, and controlling the remote rovers that are already sending momentous insights back from Mars. This emphasises an important point, women are contributing to missions on an increasing basis, compared to the days of the Apollo programme. In fact the New Horizons mission team, which last year provided the world with the closest encounter of Pluto and it’s moon Charon, is 25% female, making it the NASA mission with the highest number of female staffers, including engineers and scientists. The newest four female members of NASA’s astronaut corps also describe how they felt the moment they realised they were chosen in 2013 and how they were inspired to apply. Nicole Aunapu Mann: I’m probably one of the few astronauts who didn’t know that’s what I wanted to do as a kid. “Astronaut” seemed like a far-fetched dream. I’m from Penngrove, California, and it wasn’t until my first tour in Iraq flying fighter jets with the Marine Corps that I realized one day I might actually be a good candidate. Going into space will be the absolute coolest thing in the world. Glamour’s feature also discusses the logistics of relationships in space whilst on a multi-year interplanetary mission and the intricacies of astronaut training. From the feeling of being weightless in a zero-g plane, practicing a spacewalk underwater and even to learning to be a dentist. NASA recently opened a call for the next generation of NASA astronauts, closing mid-February. If you’re a US citizen and would like your chance to explore the Moon or even Mars, apply now! Women currently represent 26% of NASA’s astronaut corps, let’s work to bring that up to 50%.